Charles Lewis Topel Sr. was born on 8 August 1862 at Germany. He married Matilda Augusta Schlitter circa 1888. Charles Lewis Topel Sr. died on 17 May 1955 at Clayton, Iowa, at age 92. [S250] U.S. Federal Census 1930 U.S. Federal Census, by Ancestry.com, Year: 1930; Census Place: Linton, Allamakee, Iowa; Roll: 640; Page: 3A; Enumeration District: 12; Image: 945.0; FHL microfilm: 2340375. Name Variation Matilda Augusta Schlitter was also known as Tillie. Name Variation Matilda Augusta Schlitter was also known as Mathilda G.
Married Name circa 1888 As of circa 1888,her married name was Topel. Matilda Augusta Schlitter was born in 1864 at Germany. She married Charles Lewis Topel Sr. circa 1888. Matilda Augusta Schlitter died in 1931 at Clayton, Iowa. Children of Matilda Augusta Schlitter and Charles Lewis Topel Sr.
Albert A. Topel was born circa 1891 at Iowa. He was the son of Charles Lewis Topel Sr. and Matilda Augusta Schlitter. George Topel was born circa 1907 at Iowa. Arland Decellis Topel was born on 23 April 1925 at Iowa. He was the son of Theodore Arthur Topel and Geneva Gertrude Clark. Arland Decellis Topel died on 10 June 1952 at Los Angeles, California, at age 27. He was buried after 10 June 1952 at Inglewood Park Cemetery, Inglewood, Los Angeles, California. [S373] U.S. Federal Census 1940 U.S. Federal Census, by Ancestry.com, Year: 1940; Census Place: Cedar Rapids, Linn, Iowa; Roll: T627_1176; Page: 4A; Enumeration District: 57-64. Married Name Her married name was Christensen. Ramona D. Topel married (?) Christensen. Ramona D. Topel was born on 19 January 1929 at Decorah, Iowa. She was the daughter of Theodore Arthur Topel and Geneva Gertrude Clark. Ramona D. Topel died on 25 January 2011 at Marion, Iowa, at age 82 Ramona D. Christensen, 82, of Marion, died Tuesday, January 25, 2011, at Willow Gardens Care Center in Marion, after battling a series of illnesses. Graveside Service: 11 a.m., Thursday, January 27, 2011, Cedar Memorial Park Cemetery, Cedar Rapids. Arrangements by Murdoch Funeral Home & Cremation Center in Marion. Survivors include her daughter, Janice Ruggles; 5 grandchildren; and 2 great-grandchildren. She was preceded in death by her husband; a son, Kenneth; granddaughter, Erika; and two brothers. Ramona was born January 19, 1929 in Decorah, Iowa, the daughter of Theodore A. and Geneva (Clark) Topel. She graduated from Marion High School in 1947. Ramona worked various secretarial jobs in town. She was a member of Salem United Methodist Church where she taught Sunday school. Ramona enjoyed the outdoors, gardening, hiking, and was a member of the Cedar Rapids Emmaus Community. Leland Topel was born circa 1936 at Iowa. Leland Topel died before 2011. Charles Lewis Topel Jr. was born on 26 July 1888 at Allamakee, Iowa. Charles Lewis Topel Jr. died on 1 June 1949 at Monona, Clayton, Iowa, at age 60. (?) Christensen married Ramona D. Topel, daughter of Theodore Arthur Topel and Geneva Gertrude Clark. (?) Christensen died before 2011. Kenneth Christensen was the son of (?) Christensen and Ramona D. Topel. Kenneth Christensen died before 2011. Married Name after 1940 As of after 1940,her married name was Fickbohm. Christine Klar was born circa 1919 at South Dakota. She married Walter Fickbohm, son of Walter Douglas Fickbohm and Mary M. Kiewel, after 1940. Married Name Her married name was Holt. Diane Fickbohm was born on 22 May 1944 at Vermillion, South Dakota. She was the daughter of Walter Fickbohm and Christine Klar. Diane Fickbohm died on 10 September 2012 at Sioux Falls, South Dakota, at age 68 Diane Holt was born May 22, 1944 in Vermillion, South Dakota to parents Walter and Christine (Klar) Fickbohm. She died September 10, 2012 in Sioux Falls at the age of 68 years. Diane was raised in the Spink, SD area and attended South Spink School. She graduated from Alcester High School in 1962. Diane had one daughter, Lisa. She worked at Custom Coils in Alcester and Otis Radio in Hawarden, Iowa for many years. Diane returned to school and graduated with honors from Southeast Technical School in Sioux Falls and worked at Wells Fargo and the past five years in the operation center at First Premier Bank in Sioux Falls. She was a member of Nathanael Lutheran Church in Alcester where she was in the Bell Choir for many years and was active in a Bible study in Beresford. Diane loved spending time with her family, including playing dominos and cards with them, and she had a heart for taking care of abused shelter dogs. Her family includes her daughter, Lisa (Reid) Jorgensen of Sioux Falls; brothers, Warren (Denise) Fickbohm of Brandon and Paul (Vicky) Fickbohm of Florence, AL; three nephews, John, Brian and Matthew Fickbohm; her dog, Sage; and many cousins and friends. Her parents, Walter and Christine Fickbohm, preceded her in death. Funeral services will be held at 10AM Thursday, September 13, 2012 at Nathanael Lutheran Church in Alcester, SD. Visitation will be from 5-7PM Wednesday at Nathanael Lutheran Church with a prayer service at 7PM. Name Variation Olaf A. Rogde was also known as Rodge. Name Variation Olaf A. Rogde was also known as Ole. Olaf A. Rogde was born on 23 September 1909 at South Dakota. He married Hazel Mae Dadison on 2 July 1931 at first marriage for both, Clark, South Dakota. Olaf A. Rogde was SEPARATION before December 1943; enlistment records on 3 Dec 1943 show Olaf as "Separated, without dependents." He and Hazel Mae Dadison were divorced before 1944. Olaf A. Rogde married Fern Iola Peterson circa 1944. Olaf A. Rogde and Fern Iola Peterson were divorced before 1960. Olaf A. Rogde married Winifred Alfreda Clark, daughter of James Monroe Clark and Della Angeline Cummins, before 1960. Olaf A. Rogde died on 13 July 1976 at Marshall, Iowa, at age 66. Olaf A. Rogde obtained US Social Security Card at Washington; last residence Marshalltown, Marshall, Iowa. He and Fern Iola Peterson lived in 1946 at Des Moines, Polk, Iowa. Olaf A. Rogde and Winifred Alfreda Clark lived in 1960 at Marshalltown, Iowa. Married Name 2 July 1931 As of 2 July 1931,her married name was Rogde. Hazel Mae Dadison was born circa 1909. She married Olaf A. Rogde on 2 July 1931 at first marriage for both, Clark, South Dakota. Hazel Mae Dadison was SEPARATION before December 1943; enlistment records on 3 Dec 1943 show Olaf as "Separated, without dependents." She and Olaf A. Rogde were divorced before 1944. Married Name circa 1944 As of circa 1944,her married name was Rogde. Married Name circa 1944 As of circa 1944,her married name was Rodge. Fern Iola Peterson was born on 7 September 1912 at Iowa. She married Olaf A. Rogde circa 1944. Fern Iola Peterson and Olaf A. Rogde were divorced before 1960. Fern Iola Peterson died on 6 May 2000 at Webster, Iowa, at age 87. Fern Iola Peterson and Olaf A. Rogde lived in 1946 at Des Moines, Polk, Iowa. Name Variation Edward Alfred Wallum was also known as Wollum. Edward Alfred Wallum was born on 2 April 1888 at Miner, South Dakota. He was the son of Erick E. Wallum and Elizabeth Satter. Edward Alfred Wallum married Martha Ida Withrow, daughter of Wesley S. Withrow and Elizabeth Jane Hooser, circa 1913. Edward Alfred Wallum died on 29 August 1975 at age 87. He was buried after 29 August 1975 at Pleasant View Cemetery, Carthage, Miner, South Dakota. [S250] U.S. Federal Census 1930 U.S. Federal Census, by Ancestry.com, Year: 1930; Census Place: Esmond, Kingsbury, South Dakota; Roll: 2225; Page: 4B; Enumeration District: 11; Image: 686.0; FHL microfilm: 2341959. Name Variation Alferd A. Wallum was also known as Clifford. Alferd A. Wallum was born on 15 July 1914 at South Dakota. He was the son of Edward Alfred Wallum and Martha Ida Withrow. Alferd A. Wallum married Muriel Elda Beryl Timm on 24 August 1943. Alferd A. Wallum died on 30 April 1994 at South Dakota at age 79. He was buried after 30 April 1994 at Manchester Cemetery, Manchester, Kingsbury, South Dakota. Married Name 11 November 1936 As of 11 November 1936,her married name was Moore. Olive E. Wallum was born on 18 January 1916 at South Dakota. She was the daughter of Edward Alfred Wallum and Martha Ida Withrow. Olive E. Wallum married Floyd L. Moore on 11 November 1936 at Brookings, South Dakota. Olive E. Wallum died on 5 May 1990 at South Dakota at age 74. [S373] U.S. Federal Census 1940 U.S. Federal Census, by Ancestry.com, Year: 1940; Census Place: Manchester, Kingsbury, South Dakota; Roll: T627_3859; Page: 4B; Enumeration District: 39-18. Deone C. Wallum was born on 17 March 1918 at South Dakota. Deone C. Wallum died on 1 April 1993 at age 75. Milo E. Wallum was born on 13 March 1920 at South Dakota. Milo E. Wallum married Juanita Beachler on 29 December 1945 at Kingsbury, South Dakota. Milo E. Wallum died on 9 April 1993 at age 73. Jarvis Wallum was born on 8 July 1922 at South Dakota. Jarvis Wallum died in June 1979 at age 56. Married Name 23 November 1946 As of 23 November 1946,her married name was Geyer. Joyce LaVonne Wallum was born on 13 March 1925 at twin with Joy, Carthage, South Dakota. Joyce LaVonne Wallum married Richard Geyer on 23 November 1946. Joyce LaVonne Wallum died on 11 April 2013 at age 88 Joyce LaVonne Geyer, age 88, of rural De Smet, died Thursday, April 11, 2013, at Avera Hospital in Sioux Falls. Services have been set for Tuesday, April 16 at 10:30 a.m. at the American Lutheran Church in De Smet. 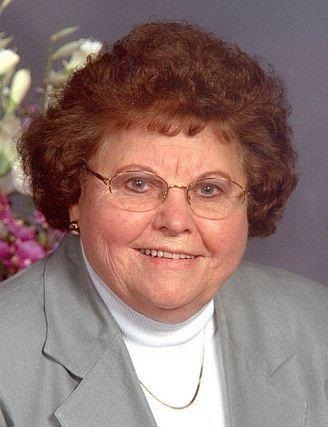 Visitation will be at the Osthus Funeral Home in De Smet today (Monday) from 5 to 7 p.m. Joyce LaVonne Wallum was born on March 13, 1925, at Carthage to Edward and Ida Wallum. Grateful for having shared in her life are her four sons, Ronald of De Smet, Jerry (Kristi) of Huron, Dan (Linda) of De Smet and Rex (Lynette) of De Smet; a daughter, Bonnie Geyer of Huron; a daughter-in-law, Carol Geyer of De Smet; 12 grandchildren; 14 great-grandchildren; one great-great-grandchild; two stepgrandchildren; six stepgreat-grandchildren; one twin brother, Joy “Smokey” Wallum and his wife Dolly of Iroquois; a sister-in-law, Evie (Harold) Platt of Brookings; brothers-in-law, Robert (Darlene) Geyer and Art (Barb) Geyer; and a sister-in-law, Ruth Muilenburg, all of De Smet; and several nieces and nephews. She was buried after 11 April 2013 at Manchester Cemetery, Manchester, Kingsbury, South Dakota. Name Variation Erick E. Wallum was also known as Wollum. Erick E. Wallum was born in September 1846 at Norway. He married Elizabeth Satter, daughter of (?) Satter, circa 1875. Erick E. Wallum died on 10 February 1916 at Miner, South Dakota, at age 69. Name Variation Elizabeth Satter was also known as Bergit. Married Name circa 1875 As of circa 1875,her married name was Wollum. Married Name circa 1875 As of circa 1875,her married name was Wallum. Elizabeth Satter was born circa 1850. She was the daughter of (?) Satter. Elizabeth Satter married Erick E. Wallum circa 1875. Elizabeth Satter died before 1900 at Miner, South Dakota. Richard Geyer was born on 7 August 1921. He married Joyce LaVonne Wallum, daughter of Edward Alfred Wallum and Martha Ida Withrow, on 23 November 1946. Richard Geyer died on 7 February 1995 at age 73. He was buried after 7 February 1995 at Manchester Cemetery, Manchester, Kingsbury, South Dakota. Floyd L. Moore was born circa 1914 at South Dakota. He married Olive E. Wallum, daughter of Edward Alfred Wallum and Martha Ida Withrow, on 11 November 1936 at Brookings, South Dakota. Married Name 29 December 1945 As of 29 December 1945,her married name was Wallum. Juanita Beachler was born on 28 December 1919. She married Milo E. Wallum, son of Edward Alfred Wallum and Martha Ida Withrow, on 29 December 1945 at Kingsbury, South Dakota. Juanita Beachler died on 25 May 2009 at age 89. Name Variation Anne Mikkoline Wallum was also known as Wollum. Name Variation Anne Mikkoline Wallum was also known as Lena. Anne Mikkoline Wallum was born on 28 July 1876 at Riceland, Freeborn, Minnesota. She was the daughter of Erick E. Wallum and Elizabeth Satter. Name Variation Emma Randine Wallum was also known as Wollum. Emma Randine Wallum was born on 25 February 1879 at Riceland, Freeborn, Minnesota. John Elmer Mechler was born on 21 June 1895 at Wisconsin. He was the son of Bernard Mechler and Sarah Helbing. John Elmer Mechler married Alta Curtis circa 1921. John Elmer Mechler died on 16 October 1977 at Cuba City, Grant, Wisconsin, at age 82. He was buried after 16 October 1977 at Mount Pleasant Cemetery, Cuba City, Grant, Wisconsin. [S245] U.S. Federal Census 1900 U.S. Federal Census, by Ancestry.com, Year: 1900; Census Place: Potosi, Grant, Wisconsin; Roll: 1790; Page: 11A; Enumeration District: 0051; FHL microfilm: 1241790. [S244] U.S. Federal Census 1910 U.S. Federal Census, by Ancestry.com, Year: 1910; Census Place: Paris, Grant, Wisconsin; Roll: T624_1711; Page: 2B; Enumeration District: 0039; FHL microfilm: 1375724. [S243] U.S. Federal Census 1920 U.S. Federal Census, by Ancestry.com, Year: 1920; Census Place: Paris, Grant, Wisconsin; Roll: T625_1988; Page: 8A; Enumeration District: 118; Image: 300. [S250] U.S. Federal Census 1930 U.S. Federal Census, by Ancestry.com, Year: 1930; Census Place: Hazel Green, Grant, Wisconsin; Roll: 2574; Page: 4A; Enumeration District: 18; Image: 288.0; FHL microfilm: 2342308. [S373] U.S. Federal Census 1940 U.S. Federal Census, by Ancestry.com, Year: 1940; Census Place: Hazel Green, Grant, Wisconsin; Roll: T627_4481; Page: 5B; Enumeration District: 22-18.